When I spoke with director Roger Michell (Changing Lanes, Venus) about casting Bill Murray to play Franklin D. Roosevelt in his new film Hyde Park on Hudson, Michell was emphatic in defending his pick to portray the 32nd president of the United States. See? 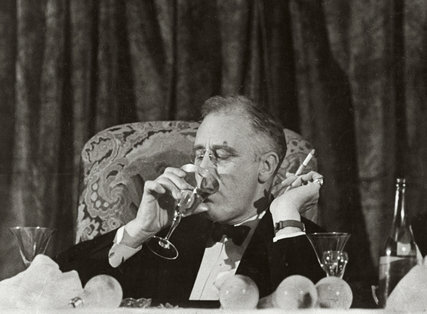 Bill Murray is probably too awesome and entirely too party to play Franklin Roosevelt. And yet Murray knocks it completely out of the park. Kenneth Branagh in Warm Springs. Jon Voight in Michael Bay’s profoundly unpleasant Pearl Harbor. Charlton Heston, voicing FDR in F.D.R. Edward Herrmann in Eleanor and Franklin. Dennis Howard in “The Wonderful World of Disney” version of Annie. Roger Jackson in that episode of Robot Chicken. Bill Murray’s FDR is more elegant—and more of a good time—than any of those previous attempts.